Triclosan: it’s in your soap, body wash, and your toothpaste. Triclosan is an antibacterial agent added to personal care products, cosmetics, and even toys, kitchenware, and furniture. While soap is rarely the centre of a news story, triclosan has become increasingly controversial after the United States Food and Drug Administration (FDA) banned it from hand soaps. Meanwhile, Canada has labelled the chemical as toxic to the environment although it does not meet the standard for human health toxicity. What is triclosan and where is it used? Antibacterial soaps, also known as antimicrobial or antiseptic soaps, contain many chemicals that reduce bacterial infection. Triclosan’s commercial use has expanded over the last two decades, and today it’s estimated that 3 of every 4 antibacterial liquid soaps contain triclosan. Antibacterial agents, like triclosan, were originally used in surgical scrubs and hand washes to protect health workers in medical settings from bacteria that cause infections in hospitals. In surgical units, triclosan is effective against bacteria such as methicillin-resistant Staphylococcus aureus (MRSA), which is resistant to most antibiotics. Triclosan can also be found in some Colgate toothpaste, because it has been linked to preventing cavities. In 2008, the Environmental Working Group (EWG) found high levels of triclosan in San Francisco Bay, which prompted studies of this chemical in blood and urine samples of teenage girls to explore its impact on endocrine hormonal processes. While its effect on human endocrine systems was inconclusive, the EWG submitted a report to the FDA in 2014 recommending that triclosan be banned in personal care products. Environment Canada has categorized triclosan as potentially toxic to aquatic organisms since it bioaccumulates—that is, it becomes concentrated in the bodies of organisms that consume it. Even at low concentrations in aquatic plants and animals, it inhibits growth and impairs reproduction, impacting species survival. Triclosan is also persistent, meaning that it does not degrade easily. Once it is washed down the drain, most wastewater treatment plants cannot effectively filter out triclosan, and it enters our lakes and waterways. Animal studies involving triclosan have shown that mice exposed to antibacterial ingredients were more likely to develop liver cancer. Another study exposed pregnant rats to triclosan and found their hormone (progesterone, estradiol, testosterone) levels dropped, potentially affecting fetal development. Triclosan’s structure is similar to thyroid hormones, so scientists have suggested that it may bond to hormone receptors. As a consequence, it can interfere with normal thyroid hormone functions, raising concerns about reproductive impacts. However, no study has definitely shown how harmful triclosan is to humans. Lab studies also suggest that triclosan can randomly generate mutations in bacteria. This could lead to increased antibiotic resistance in bacteria, creating “superbugs” and decreasing the effectiveness of antibiotics. Why did the FDA ban triclosan in soaps? The FDA banned triclosan and other ingredients in soaps because there is no compelling evidence that the ingredients are safe. In 2013, the FDA asked manufacturers to submit evidence showing that antibacterial ingredients are safe for long-term use and more effective than regular soap at reducing the spread of germs. 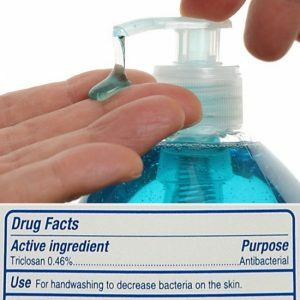 Manufacturers failed to convince the FDA of triclosan’s benefits in soaps and subsequent research suggested triclosan and similar agents might actually be harmful. “Consumers may think antibacterial washes are more effective at preventing the spread of germs, but we have no scientific evidence that they are any better than plain soap and water,” said Dr. Janet Woodcock, director of the FDA’s Centre for Drug Evaluation and Research in a press release. The FDA’s ban applies only to personal hygiene products. It does not extend to things like toys, furniture, and apparel because the FDA does not regulate them. The Canadian government has announced that triclosan is not hazardous to human health, but has declared it toxic under the Environmental Protection Act because of its negative effect on aquatic organisms. Health Canada has restricted the amount of triclosan in mouthwash and personal care products, but has not banned the chemical. While concentration limits of triclosan are low (0.03% in mouthwashes, 0.3% in cosmetics), even these small amounts will bioaccumulate in our aquatic ecosystems. Environment Canada has flagged triclosan for future assessment. According to Health Canada , “The health and safety of Canadians is of utmost importance… The government will continue to monitor new scientific evidence related to triclosan and will take further action if warranted.” Many environmentalists and scientists are pushing for Canada to implement a ban of these chemicals in consumer products. Canada does plan to introduce measures to limit the release of triclosan from consumer products into waterways. But this may prove more challenging, as it will require improved wastewater treatments to remove these chemicals—a costly endeavour. An earlier version of this article was published on March 28, 2017 in the Green Chemistry Initiative Blog. This article has been modified for the Borealis Blog. Chemistry antibacterial soap, antibiotic resistance, Connie Tang, environmental monitoring, triclosan. permalink. Science journalism is threatened. How can scientists help?